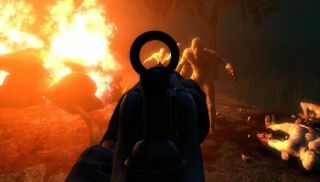 Whether you want to shoot monsters or become one, Steam is hosting a couple of free weekend trials for Killing Floor and Tropico 5. Both games are free to download through Steam right now through to 1pm Sunday Pacific time / 9PM GMT. Both games are cheap this weekend as well, so if you enjoy your extended demo, you can pick up either game at 75% off. Killing Floor is particularly worthwhile if you convince some friends to pick it up with you. It's a co-op horde survival shooter with some immensely satisfying guns (courtesy of Tripwire, who made the great Red Orchestra games). Tropico 5 is a more measured and darkly humorous game about running a dictatorship which we rather enjoyed. "Over the course of my extended presidency I've smuggled rum into a prohibition America, sided with Axis powers during both World Wars, systematically stripped away the liberty of my citizens, and assassinated a grandma for opposing my regime," wrote Phil in our review. Sounds like a good time to me.